Not as good as either of the other movies, but still pretty remarkable in it’s epic scope and action sequences. The Return of the King is the epic battle movie and the conclusion to the great fantasy trilogy of the last few decades. Te Lord of the Rings trilogy is unquestionably the single trilogy that is cherished most and regarded in highest esteem among young viewers of today. People who are a little bit older have Star Wars, and that trilogy might have better storytelling and more arch-type like heroes, but the LOTR trilogy has better and more exciting action. And as the great trilogy of our time, the final film ends it all with them throwing whatever they can at the screen. This is the great battle at last. From giant trolls to elephants to pirates to ghosts to dragons, it’s all here. And that’s a good thing. The movie feels amazing in it’s action and computer effects. The problem is nearly every bit of it comes in the second half. That means over an hour of just the same old thing, before we are even close to the fun. This movie is good, but it is far worse than the other two simple because in many ways it has run out of story to tell. The first movie was by far the best. It was the freshest and the most about a team of heroes on a single journey. Their path was straight forward and filled with many dangerous and exciting challenges. The second movie was also pretty great, although it started to take it’s time and feel like a little too much was going on. There were three stories all taking place at once there and that often became a problem with regards to pacing. The second half was certainly better than the first, but the first half did a nice job of setting up where characters were and what they were after. The third movie basically falls apart in it’s first half. There’s a great opening about Gollum and seeing how he became the way he is, but after that, Frodo and Sam just continue along with him through the mountains of Mordor. And it’s the same old thing as what was happening in the last movie. 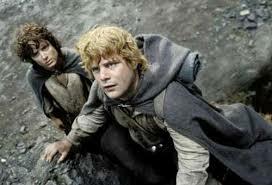 Gollum talks to himself and Sam is suspicious of him and Frodo is caught in between. Nothing new happens between the three of them for a long, long while. Pippin and Gandalf, meanwhile, ride from Rohan to Gondor where we come to the great white city that will serve as the big location set piece for this final film. The great battle will take place in front of and behind these city walls. But first, we meet Denethor, the Steward of Gondor, a man who runs the city but is not the King. This guy is a villain and a real scum and he tells his son Faramir things like “I wish it was you who had died and not your brother.” We spend a lot of time around Denethor and none of it is enjoyable. We watch him order his son to ride out to certain death and then eat a disgusting meal while his men are being slaughtered. This stuff is not entertaining. It is just disturbing and unpleasant. When we finally do get to the second half, the movie starts to come to life. Frodo and Sam now have real challenges ahead of them including a giant spider and then a struggle to get to the top of Mount Doom. And the great battle is an absolute masterpiece. That is until the ghosts are brought in. One thing I love about the great battle is that it is like one round of creatures or attacks after another, and each round is bigger than the last. First the trolls of Mordor march in and bust through the city walls. This includes dragons flying overhead and catapults launching huge stone into and out of the city. After the trolls break in, the men of Rohan show up on their horses and ride right over the orcs. After these men it’s the elephants. After the elephants it’s the pirate ships and ghosts. The ghosts start out pretty cool when Aaragorn goes to see them in their cave, but end up becoming a problem for the movie. In the cave, their neon green lighting is like spooky glow in the dark imagery. They move through the air like dissolving cobwebs and appear where you least expect them. The whole broken contract and reason for them being cursed is pretty cool too. But when Aragorn brings them onto the battle field later in the movie, it really is a sort of cheat. These guys can’t be killed. And they just run right over anything. The movie would have benefitted greatly from having the ghost men transform into solid form when they got on the ground. Something that the bad guys could possibly defeat. Otherwise the threat of losing is battle is removed from the equation. By the end of the movie, there is still another fight. It’s the great battle that takes place at the gates of Mordor. This battle isn’t shown in much detail once the fighting begins and the reason for that is because the movie has already spent a great amount of time watching the battle at Gondor that we have just come from. And after all is done, there are a number of endings, each one interesting and visually stunning, but still a little too much for a movie that was already very long. 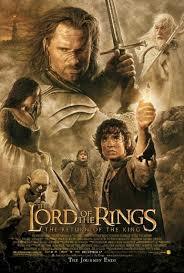 The Return of the King is the weakest of the three movies mostly because the story isn’t as menacing. The bigger things get in scope, the faker and less threatening they end up seeming. When Sam not only takes on a giant spider, but also a number of orcs by himself, you know we are miles away from the first movie where hobbits were not fighters at all. The first film focussed on details. This one focusses on giant computer effects. It wants to be over the top and it is. It’s still a good movie and has some of the most amazing acton sequences in cinematic history, but there is certainly something lacking in the depth and emotion behind the story.